Cucurbit downy mildew (CDM) was confirmed on a cucumber sample from a production field in Sampson County on May 30 of 2018. Leaves presented approximately 5% disease severity, but only 10% of the field was affected (Figure 1). Symptoms included angular chlorotic lesions on leaves and gray sporulation on the abaxial surface. Sporangiophore structures typical of the oomycete causal agent, Pseudoperonospora cubensis, were observed using a hand lens. Growers are recommended to take immediate action to protect cucurbit crops in North Carolina, especially since we are experiencing favorable weather conditions for disease. Cucumbers and melons are generally more susceptible to the disease than squash and pumpkin. The pathogen quickly becomes resistant to fungicides especially in cucumber, thus, tank mixing fungicides specific for downy mildew with a protectant fungicide and alternating modes of action is strongly recommended. Effective fungicides can be found in our Cucurbit Downy Mildew fact sheet. We also encourage commercial growers and homeowners to be diligent in checking cucurbit leaves for downy mildew and reporting the disease to the Cucurbit downy mildew IPM pipe website (CDM ipmPIPE). These reports are anonymous and crucial in warning growers throughout the east coast of an outbreak. If you think you have cucurbit downy mildew, please contact your local Extension Agent and send photos and/or physical samples to the Plant Disease and Insect Clinic. If a confirmation is made, please also be sure to make an anonymous report to the Cucurbit downy mildew IPM pipe website. 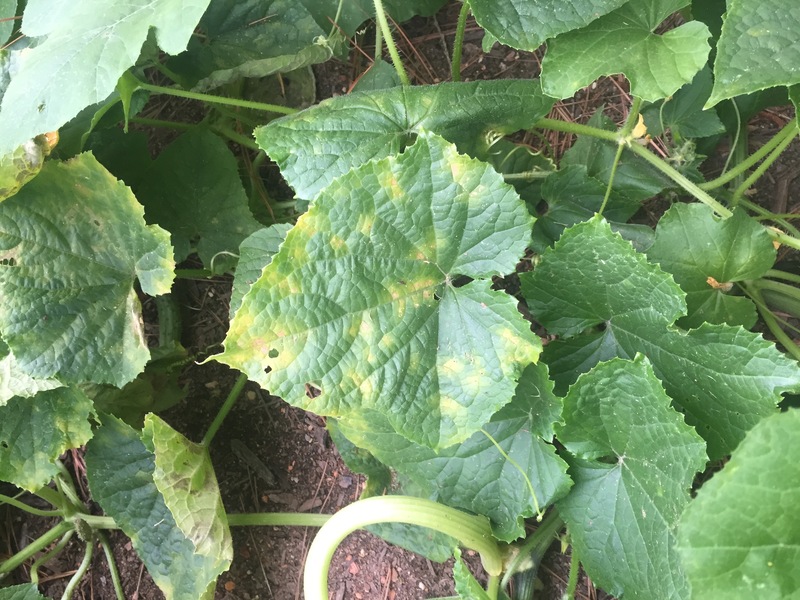 For more information about the disease and how to control it see our Cucurbit Downy Mildew fact sheet, previous alerts, and results from our demonstration trials that are conducted annually. Control recommendations are available on the Cucurbit downy mildew IPM pipe website – you can also register to receive texts, emails and/or phone alerts when new disease outbreaks are reported.